To take the next step in its growth, Texas A&M must start hanging with the big boys of the SEC. The Aggies wasted a chance to do in their 41–23 loss to Alabama. COLLEGE STATION, Texas — Julien Obioha chose to look on the bright side. About 20 minutes after No. 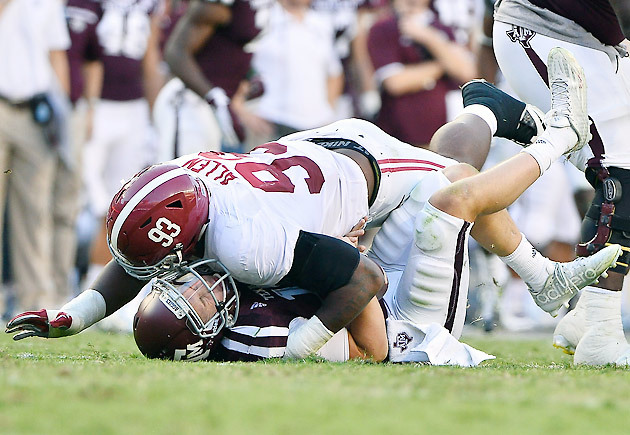 10 Alabama finished off a convincing 41–23 win over ninth-ranked Texas A&M at Kyle Field, the Aggies’ senior defensive lineman faced reporters and laid out a silver lining. Obioha and the defense had held the Crimson Tide’s offense to just 20 points; it was Texas A&M’s own offense, however, that gift-wrapped the other 21 points for Alabama. Six games into head coach Kevin Sumlin’s fourth year in College Station, Texas A&M hasn’t won many games that mattered. The coach has 33 victories since taking over the program, of course, but in reality the Aggies have very little to show for it. On Saturday against the premier program in the SEC, Texas A&M proved that it only flirts with greatness under Sumlin. It still has a long way to go before it gets there. That’s exactly why the Aggies knew what was at stake with Alabama coming to town. Texas A&M had shot out to a 5–0 start this season that included wins over Arizona State, Arkansas and Mississippi State. But in recent years the road to the SEC West title has gone through Alabama. If A&M was a bona-fide threat to the conference crown, it needed to prove it. Unfortunately for the Aggies, they dug themselves in a hole early against Alabama. In the first quarter Crimson Tide corner Minkah Fitzpatrick picked off quarterback Kyle Allen and returned the interception 33 yards for a touchdown. On the Tide’s next series, running back Derrick Henry broke through the Aggies’ defensive front for a 55-yard touchdown. Midway through the first quarter, A&M found itself down 14–0 in front of a stunningly silent Kyle Field crowd. Things went from bad to worse for the Aggies in the second quarter. Alabama safety Eddie Jackson took another Allen interception 93 yards for a score, and just like that, the Crimson Tide went into halftime up 28–13. Texas A&M had hoped to avoid a repeat of last season, when it ventured to Tuscaloosa and left with an embarrassing 59–0 loss. But this time the Aggies responded to adversity. In the third quarter Allen shook off his mistakes and found Ricky Seals-Jones for a short touchdown toss that made it 28–20. The comeback sparked a packed Kyle Field crowd, and suddenly Alabama looked as vulnerable as it did in its 43–37 loss to Ole Miss last month. Afterward Sumlin didn’t blame the loss on his quarterbacks. He did, however, admit that his team was forced to play catch-up all night. “You can’t play the way we did tonight, giving away 21 points against a good football team, and expect to win,” Sumlin said. The Aggies aren’t unfamiliar with pivot-point games under Sumlin, but they don’t always come out on the winning side. In 2012 they finished the year 11–2, but a home loss to No. 6 LSU—in which the Tigers forced five turnovers—helped keep Texas A&M out of Atlanta. A year later the program went 0–4 against ranked teams in the regular season before rallying to beat No. 24 Duke in the Chick-fil-A Bowl. In 2014 the Aggies took a 5–0 record to Starkville but fell to Mississippi State, the first of five losses in their final seven games. There’s no denying that Texas A&M has won memorable games under Sumlin. Eventual Heisman Trophy winner Johnny Manziel helped engineer an upset of No. 1 Alabama in 2012 that still resonates in Aggieland. Just last season an unranked Texas A&M team upset No. 3 Auburn on the Plains. But the question is whether this program has the capacity to do more. At this time last season, fans were poised to anoint an unbeaten Texas A&M squad as SEC champions. The Aggies failed to live up to their billing. Even the greatest teams can lose games, and the winner at Kyle Field on Saturday is no exception. Alabama has already lost to Ole Miss, but coach Nick Saban’s program deserves some benefit of the doubt: Last year it rebounded from a loss to Ole Miss in Oxford to win the SEC and reach the College Football Playoff. Texas A&M, however, hasn’t earned that same clout. After this defeat the Aggies are 1–6 against ranked teams at home under Sumlin. That’s hardly a recipe for playoff contention. Some Texas A&M fans won’t lose sleep over the program’s current climate. Sumlin and his staff know how to recruit, and they win enough games to remain relevant in the SEC. Swagcopters and #YESSIRs are enough to keep most fan bases happy. But those who expect more can’t like the lack of big-game potential Texas A&M displays. It has yet to prove it can become an elite program in the SEC. The good news for Texas A&M is the season is only half over. Plenty of opportunities remain for the Aggies to make their mark on the conference. Next week they travel to face a reeling Ole Miss squad in Oxford, and their three SEC games after that—South Carolina, Auburn, at Vanderbilt—are manageable before a daunting trip to LSU at the end of the year. It’s also wise to put Saturday’s loss in perspective: Alabama could very well finish as a playoff team. But to take their next step, the Aggies must eventually hang with the big boys. That’s why the next few weeks will be telling for the program’s future. How Texas A&M responds to adversity could make or break its status as an elite program in college football.